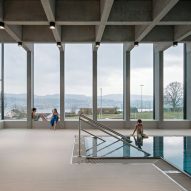 Illiz Architektur mounted this indoor swimming pool on top of a disused concrete shelter for rescue forces to offer bathers views of Switzerland's Lake Zurich. 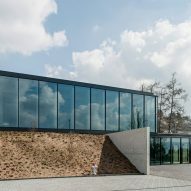 Zurich-based Illiz Architektur won a competition to design the Swimming Pool Allmendli – a 1,131 square metre centre for children to learn how to swim. Located at the edge of the Erlenbach school campus, the subterranean soldier's billet had disappeared under an overgrown hill and a sports field over the years. From outside, the only identifiable markings were two entries dug into the hillside. The architects left the raw character of the old concrete facility intact, and suspended the pool above, at the top of the hill. The surface of the water is level with the surrounding terrain, offering expansive views over Lake Zurich. 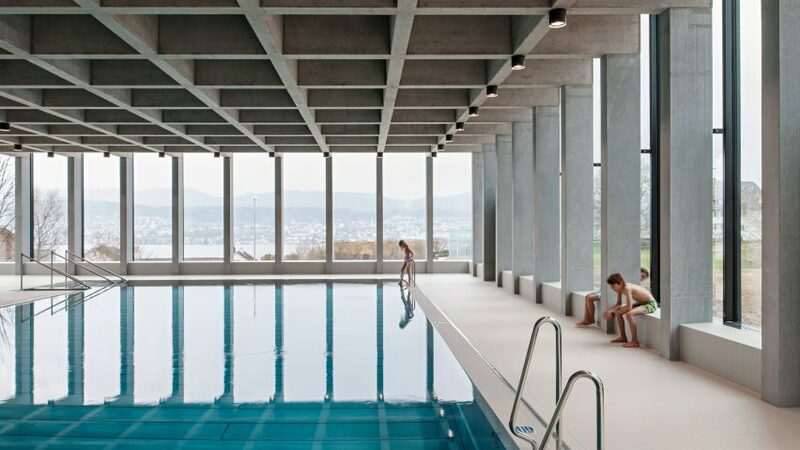 "Instead of excavating under the former billet to accommodate the enormous volume of the pool, the pool would simply be suspended above the existing cubature of the underground space," said the architects who worked with local engineers Pöyry Schweiz AG to complete the design. On the outside, a row of slender steel columns and glass encases the pool, resting on two large concrete walls on the lower level. Inside, the concrete columns remain exposed, supporting a coffered concrete ceiling that spans the bathing hall. 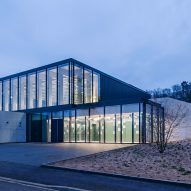 "The actual bathing hall was designed as a light-filled pavilion over the new pool and now marks the urban end of the school grounds," said the architects. Between these concrete columns, the silver-grey floor folds into benches that encircle the pool. The interior walls are covered with tiles in different hues of green and purple. The southeast corner of the military billet was exposed and parts of the outer wall removed. A one-storey glass facade now fills the span between the two flanking walls, providing a view into the previously hidden interior of the building. 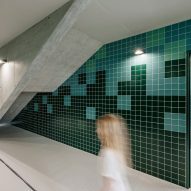 This space is occupied by the entrance hall covered in dark green wall tiles with a thin strip of lighter ones on the higher part. Besides the pool’s volume and lift platform, the underground space was also used to house the technology and systems required for the building and pool, as well as an entrance hall and adjoining changing rooms. 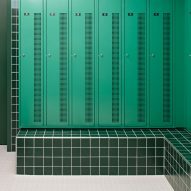 These coloured tiles, which are intended to reference the hues of a shady, clear lake – continue in geometric formations across the changing room. Lockers and doors inside here are also painted dark green. As the narrow concrete stair leads up to the pool room from the changing room, the wall design become lighter and brighter in silvery green and delicate pink. The surface of the water appears at the horizon at the top of the steps. Other community pool houses include a facility in suburban Vancouver with a roof made from a series of giant trusses, one in Spain's Basque Country clad in metal and glass and a renovated concrete natatorium in a Parisian suburb. Photography is by Hertha Hurnaus.